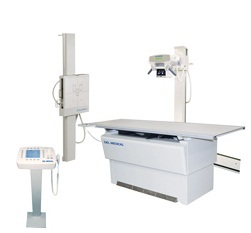 Radiographic Imaging of South Florida supplies a variety of general purpose Radiographic X-Ray equipment, software and supplies that can be used in virtually any medical environment such as hospitals, emergency rooms, and imaging centers. Pre-owned equipment is available for certain proudcts. A small display of our products are described below. For a full list of our product inventory, please contact us for more information. 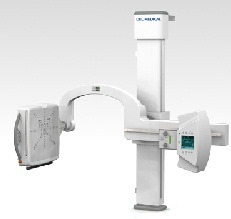 The OTC12D is a state-of-the-art imaging suite offering complete exam versatility, precision and reliability. 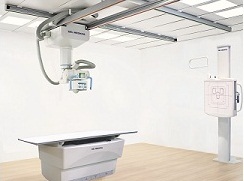 The durable OTC12 overhead tube crane combined with our industry leading 800lb patient load elevating table and slender design wall stand can readily meet the demands of the busiest imaging environments. 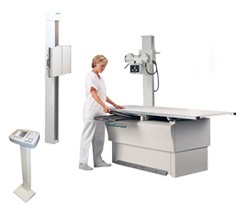 With an incredibly low total cost of ownership, the OTC12D is ideal for high-throughput environments such as hospitals, emergency rooms, imaging centers and high volume outpatient facilities. A flexible overhead tube support featuring a compact, slim design complete with motorized vertical travel, minimizing operator fatigue. 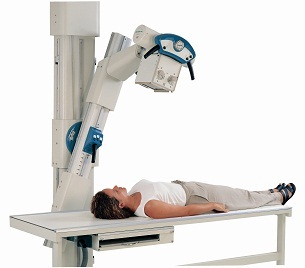 Combine with a table and wall bucky for an affordable imaging system capable of all general purpose radiographic procedures. 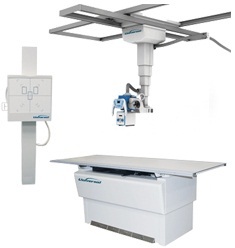 A Del Medical CTM2020 Ceiling Tube Mount System is designed to facilitate a wide range of radiographic procedures. This simple to use, ceiling mounted tube support features motorized vertical travel with servo-linked tube support to both a wall bucky and table ensuring accurate alignment. 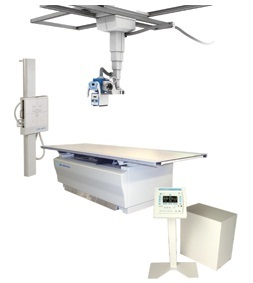 The CTM2020 system can be configured with 300,000, 400,000 or 600,000 HU x-ray tubes and either manual or automatic collimators. This tube stand only requires a floor mounted rail for support and can be installed in rooms with ceiling heights as low as 87" (221cm). It is an ideal choice for a complete range of radiographic procedures and eliminates the need for costly room modifications. 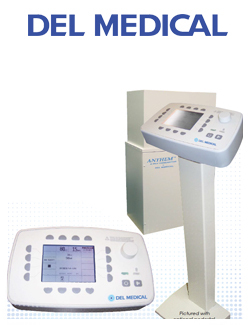 High frequency technology, combined with advanced microprocessor control design equals a generator that is reliable and fl exible to the preferences of the technologist.